newmarket fair mall | That Mall is sick and that Store is dead! A long-standing holiday tradition – shopping! NEIL CORNISH Staff Writer. Daily Press [Newport News, Va] 19 Dec 1990: B7. Four stores at Newmarket Fair have announced they will not renew their leases when they expire at the end of the year. B. Dalton Bookseller, Frederick’s of Hollywood, Butler’s Shoe Store and Dutch Maid Donut Shop will leave the mall next year, said Deborah Moreau, who manages the mall for owner Goodman Segar Hogan. Moreau said most of the stores had told her last spring they did not plan to renew their leases. She said she is negotiating with prospective new tenants, whom she did not identify. Lesley Mellor, B. Dalton manager, said the store will close Jan. 10. Officials with Butler’s corporate office in Atlanta declined comment concerning the store closing. Frederick’s store manager also declined to comment on the closing. Goodman Segar Hogan spent $9 million to renovate Newmarket Fair, originally Newmarket North, to keep up with the newly refurbished Coliseum Mall in Hampton and the newer Patrick Henry Mall in Newport News. Merchants waited 10 months while work crews completed the facelift, which included the addition of a food court, carousel and skylighting. The food court has not yet opened. Moreau said a number of the mall’s merchants will be undergoing store renovations and relocations in coming months as Newmarket Fair tries to improve its tenant mix. Fine’s Men Shop and The Athlete’s Foot have renovations scheduled, and a new arcade, Tilt, will soon be opening upstairs near the carousel. The mall is still looking for men’s and women’s ready-to-wear stores as tenants, Moreau said, as well as a children’s store and specialty gift store. A sporting goods store is also planned for the mall, she said. Moreau said its not surprising to see some turnover in a property as old as Newmarket Fair, which opened in 1975. One of its main anchor stores, Miller & Rhoads, went out of business at the start of this year. She said the defection of four smaller stores would not reflect negatively on the mall’s attractiveness to merchants nor would it place a financial strain on the mall. In some respects the vacancies may help the mall, she said, noting that Butler’s departure will leave one fewer shoe store at Newmarket, which has 10 others. Wowwwwwww. 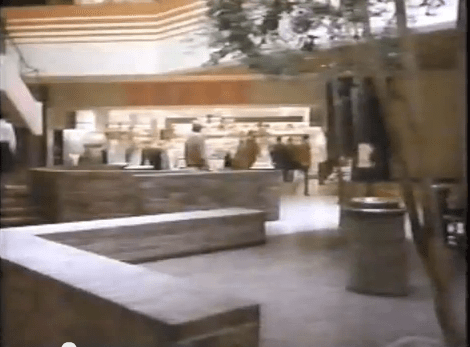 I never thought I’d ever see an old Newmarket North Mall commercial on YouTube. This is amazing, check out the quick pics of the mall. Will Newmarket’s New Look Work? HAMPTON — As work crews scurry to put the finishing touches on Newmarket North’s metamorphosis into Newmarket Fair, one question remains for mall owner Goodman Segar Hogan. Goodman Segar is gambling that its $9-million renovation will jump-start the moribund mall, which has lost ground the past three years to competitors Coliseum Mall in the Mercury Central area of Hampton and Patrick Henry Mall in the Oyster Point area of Newport News. a sluggish economy, immediate competition and the mall’s inability to fill the space vacated by one of its three anchors, Miller & Rhoads. Newmarket tenants, who have lived through 10 months of construction, said they had high expectations for the renovated mall. Deborah Moreau, Newmarket Fair’s general manager, said Goodman Segar hopes to position the mall as an entertaining, family- oriented place. To that end, the mall has added a carousel and children’s play area and has placed TV monitors in the new food court. During the pre-Christmas season, Newmarket will serve as Peninsula headquarters for the Toys For Tots campaign, Moreau said, while off-beat events such as a mall-sponsored Super Bowl party and an afternoon soap opera party are being considered. The mall’s new information center will sell lottery tickets, in addition to providing fax machine service and a drop-off point for dry cleaning. Moreau, a former marketing director for the mall, returned to Newmarket in June, following a three-year hiatus. “When I left, I thought we were holding our own competing with Coliseum,” she said. 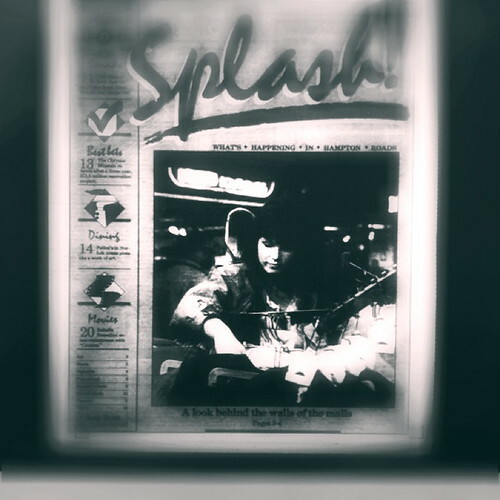 Since then, the mall has tread water while Coliseum continued to grow and Patrick Henry opened in 1987. 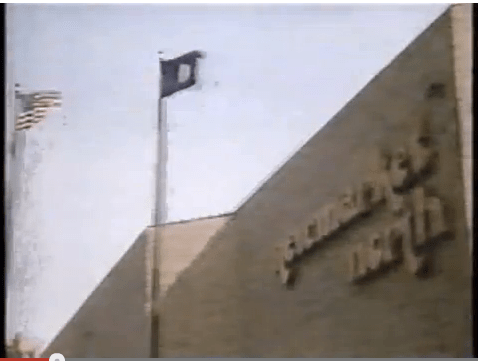 Tenants and officials saw Newmarket, built in 1975, as dark and outdated. Coliseum, located about three miles north of Newmarket, put more heat on its competitor when it completed its own renovation in 1989. Newmarket also suffered a disadvantage in access, as both Coliseum and Patrick Henry are in close proximity to Interstate 64. When Goodman Segar bought the mall in July 1989, it immediately set out to rectify the situation. The Norfolk-based company announced plans to renovate the mall on the same day it acquired the property for $34 million from Hahn Co. of San Diego and American General Insurance of Houston. Improving interior lighting was one of the primary goals, so Goodman Segar had more than 14,000 square feet of skylighting installed in the two-story mall. To improve the mall’s aesthetics, the orange and brown color scheme has been replaced with white walls accented with pastel blue. Kiosks sport the mall’s new teal, fuchsia, purple and gold colors in small glass squares. Goodman Segar is celebrating the mall’s rebirth with an invitation-only gathering today. While most of the remodeling is complete, some gaps remain. The mall’s food court will not be completed by the grand opening, Moreau said. More importantly, Goodman Segar is still struggling to fill the space left when Miller & Rhoads closed its doors in January. The Richmond-based department store chain was forced to liquidate after a failed reorganization attempt last year. Miller & Rhoads’ closing has left more than 120,000 square feet of retail space in the mall unused, and efforts to lure replacement tenants – notably Hecht’s – have been unsuccessful so far. “It’s obviously of major importance to us,” said Moreau, who added the company has no time frame for when it will find a replacement. Moreau said Newmarket’s turnaround should take less than the normal three to five years. A big hindrance is the uncertainty facing the nation’s economy, in which the Middle East crisis is playing a key role. 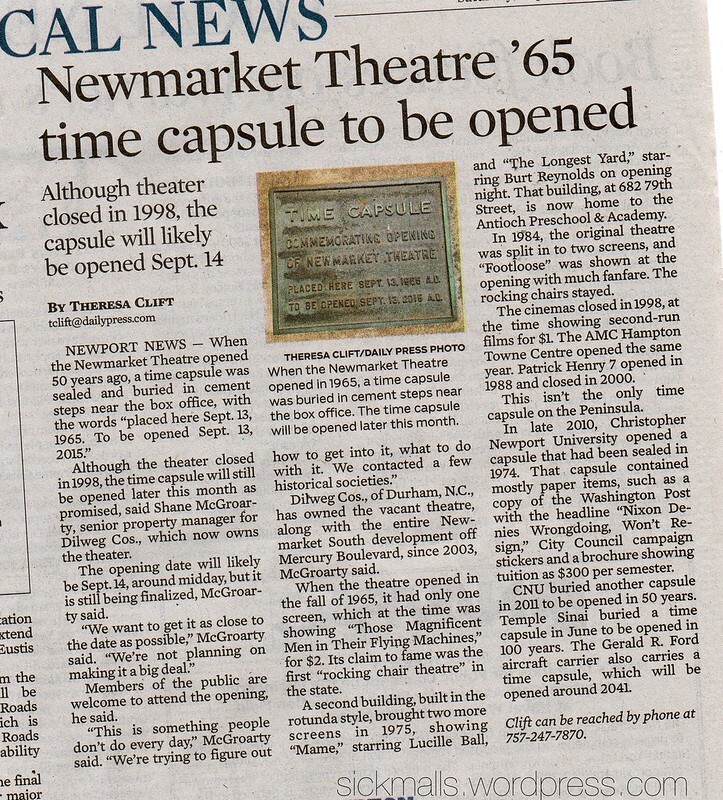 Regardless, Newmarket’s renovation has drawn praise from its competitors. 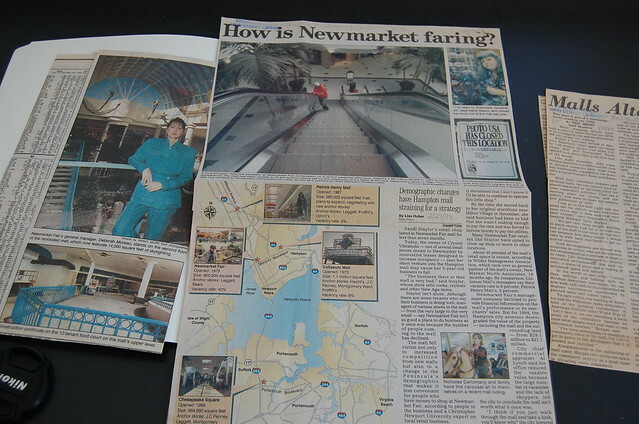 nne Marie Haverkamp, Coliseum Mall marketing director, said the renovation would increase Newmarket’s marketability. “It’s basically quite a transformation between what it was and what it is today,” said Robert Syler, project architect for The FWA Group, the North Carolina-based firm that designed Newmarket’s renovation. However, Syler said that if the proper tenant mix is not present, renovation alone will not make a mall successful. Newmarket tenants are crossing their fingers that the renovation will be just the tonic needed. Kate Turney, an employee at Camelot Records, said the renovation had already helped mall traffic pick up. “After living through all the dust and dirt and construction, we’re trying to maintain as positive an attitude as possible,” she said. The renovation has not come without a cost to retailers. Kevin Stickney, assistant manager for Hofheimer’s Shoes, said sales had dropped 30 percent from the same time last year. “I’ve noticed that the mall’s been kind of dead because of the renovations,” he said. Stickney said Newmarket’s management had no choice in deciding to renovate the mall. “They really had to do something,” he said. 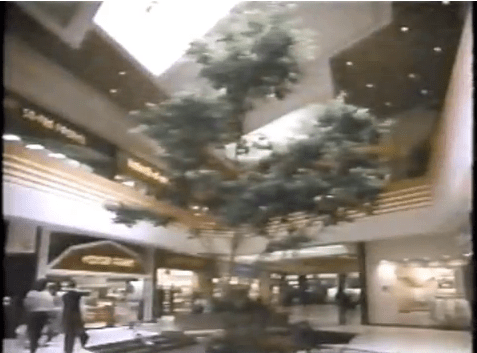 It really seems like Miller & Rhoads closing + the remodel absolutely killed the mall in 1989/1990. Probably didn’t help that Patrick Henry Mall opened in 1987. I also wonder what Deborah is doing these days. I can’t imagine “managing a dying mall in the late 1980s when malls were booming” looks good on her resume. Note how she is DRESSED LIKE THE MALL. HAMPTON — Sandi Staylor’s small shop lasted in Newmarket Fair mall for less than seven months. Today, the owner of Crystal Vibrations – one of several small stores drawn to Newmarket by innovative leases designed to increase occupancy – says her short venture into the Hampton mall may cause her 5-year-old business to fail. “The business there at that mall is very bad,” said Staylor, whose store sells rocks, crystals and other New Age items. Staylor isn’t alone. Although there are some tenants who say their business is doing well, managers of various stores in the mall – from the very large to the very small – say Newmarket Fair isn’t as good a place to do business as it once was because the number of people coming to the mall has declined. The mall fell victim not only to increased competition from new malls but also to a change in the Peninsula’s demographics that makes it less convenient for people who have money to shop at Newmarket Fair, according to people in the business and a Christopher Newport University expert on local retail business. By the time she moved back to her original storefront near Hilton Village in November, she said business had been so bad that she wasn’t making enough to pay the rent and was forced to borrow money to pay the utilities. Many Newmarket Fair retailers like Staylor have opted to close up shop or move to other locations. About 40 percent of the mall’s retail space is vacant, according to Wilder Management Association, which took over as general partner of the mall’s owner, New Market North Associates, 18 months ago. By comparison, Coliseum Mall’s managers say their vacancy rate is 8 percent; Patrick Henry Mall’s, 3 percent. Newmarket Fair’s management company declined to provide financial information on the mall’s performance or its merchants’ sales. But for 1994, the Hampton city assessor downgraded the value of the property – including the mall and the surrounding land – from $29.1 million to $21.1 million. City chief commercial appraiser Al Lynch said his office reduced the taxable value because the large number of vacancies and the lack of shoppers led the city to conclude the mall isn’t worth what it once was. “I think if you just walk through the mall and take a look, you’ll know why” the city lowered the assessment, Lynch said. “The Virginia National Guard could practice weekend maneuvers out there, and they wouldn’t step on anyone,” said Robert Coker, a marketing professor at Christopher Newport University who follows the local retail business. In an attempt to lure tenants to the struggling mall, Wilder Management will work out lease arrangements that include shorter than normal terms and ways for renters to break their lease without penalties. “We know that we have many areas to improve at Newmarket, and that’s probably an understatement,” said Andrew LaGrega, Wilder’s vice president of leasing. Wilder Management bought its share of the mall from Goodman Segar Hogan in September 1992 and took over as general partner after the Virginia Beach-based real estate developer and the mall’s limited partner couldn’t agree on a marketing strategy for the facility. Terms of the sale were not released. The mall’s limited partner, a public pension fund, has never been named. New Market North Associates bought the 800,000-square-foot mall for $34 milion in 1989 but lost one of its major tenants the following year when Miller & Rhoads closed its 120,000-square-foot anchor store. The Richmond-based chain went out of business six months after filing for bankruptcy in 1989. 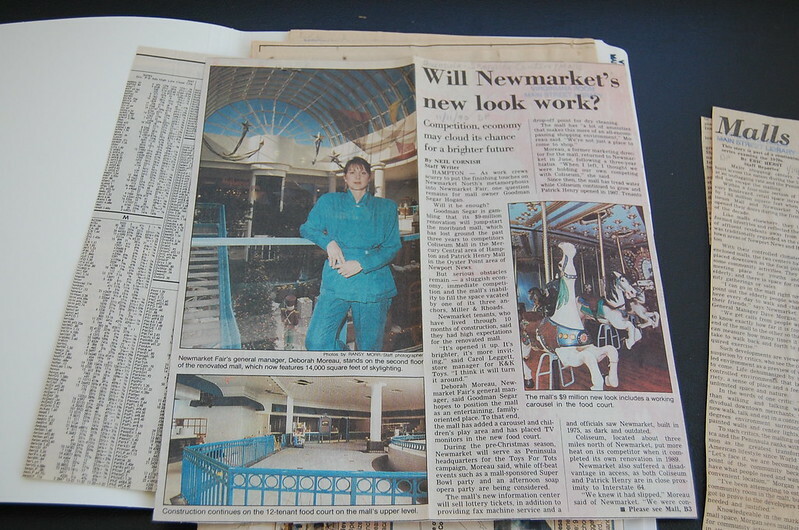 Newmarket Fair’s owners spent $9 million on a facelift in 1991 that added dramatic skylights and a carousel, but they have yet to find a new tenant for the space Miller & Rhoads left behind. The mall, on Mercury Boulevard close to Hampton’s boundary with Newport News, is currently negotiating with three possible tenants to take over parts of that space, said Charles Todd Duff, mall general manager. Altering the mall to focus on discounted merchandise was the only way Goodman Segar Hogan thought the facility would thrive, said Robert M. Stanton, former Goodman Segar Hogan chairman. “I think that a traditional mall in that location would have a serious problem,” said Stanton, who left Goodman Segar Hogan when it merged with Armanda/Hoffler Enterprises Inc. last year and started his own real estate investment company. When the mall opened in 1975, it sat at the center of the Peninsula’s highest income area, Christopher Newport’s Coker said. In the years since, many of of the Peninsula’s higher-income residents have moved north of the Oyster Point area, into York County and Denbigh. Location wouldn’t have been an issue for an outlet mall because people will travel further to get to a discount center, Stanton said. Stanton said Goodman Segar Hogan was negotiating with two discount retailers – The Sports Authority and Burlington Coat Factory – to open stores in Newmarket Fair before it sold its interest in the mall. In 1991 Leggett Stores Inc. converted part of its Newmarket store into the company’s first outlet center, offering discounted merchandise consolidated from other stores in the chain. The retailer later doubled in size the portion of the store set aside for outlet goods. 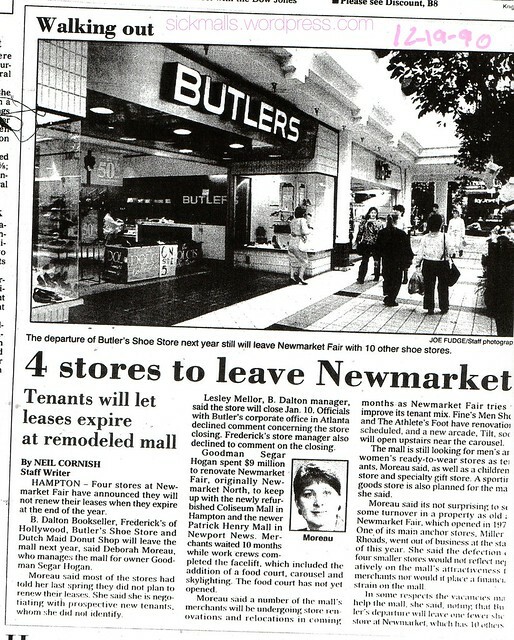 Despite Leggett’s success in the outlet market, the mall’s limited partner wanted Newmarket to remain a traditional mall. That’s when Goodman Segar Hogan decided to sell its stake, Stanton said. Coker and retailers with stores in Newmarket Fair say the 19-year-old mall is stuck in a chicken-and-egg dilemma: Without more stores, the number of shoppers won’t grow. Without more shoppers, new stores won’t open there. Sears, Roebuck and Co. has its only Peninsula store at Newmarket Fair, in a 245,000-square-foot facility that Sears owns. That is the mall’s only draw, Coker said. Without that store, the mall would probably go under, he said. “Only those shoppers who are Sears-loyal make it” to the mall, Coker said. A spokeswoman for the Chicago-based retailer declined to comment on individual store performance other than to say 1993 was a good year for the Hampton store. But Coker predicted that, eventually, Sears will follow in the footsteps of many of Newmarket’s former retailers and move to another location. “I think it’s just a matter of time,” he said, adding a Sears move would devastate the mall. Leggett, the mall’s other anchor store, also owns its Newmarket location. A spokesman for the family-owned store also declined to comment on store performance. Many retailers say the 1990 closing of Miller & Rhoads, one of Newmarket’s original anchors, set off a decline for the mall that was hastened by that year’s recession. That’s when Photo USA, which closed its Newmarket store this month after nine years in the mall, began to see a dramatic drop in sales, said Tom Tanner, company president. “That store was not making any money,” said Tanner, who bought Roanoke-based Photo USA in January after it declared bankruptcy and its assets were liquidated by the court. As the Photo USA’s new owner, Tanner said, he was not liable for leases signed by the former owner. LaGrega said Hampton’s decision to cut the assessed value of the mall by 27 percent – shaving $96,000 off its annual property taxes – may be a blessing in disguise for the facility. “It’s better for us because it makes it easier for us to bring tenants in,” he said. With less tax to pay, the mall can lower rents and still cover its costs, he said. The cheaper rents may help the struggling mall fill its vacant storefronts, said LaGrega, who declined to say how much Newmarket Fair charges for its retail space. On average, small retail spaces on the Peninsula rent for anywhere from $6 to $14 a square foot, according to a 1993 Goodman Segar Hogan Hoffler survey of retail space. Lower rent is one tactic the mall is using to help draw individually-owned stores like Staylor’s. Another is offering short-term leases, LaGrega said. Often, malls require retailers to sign leases that can last for as long as 10 years. “They were willing to work with new businesses,” said Angie Rowe, co-owner of the International Art Gallery, which opened in the mall in December. Rowe said she has a six-month lease with the option to negotiate a longer-term lease at the end of that time. The short lease gave her store the opportunity to test the waters in the mall before jumping in with both feet. So far, she’s happy with the success of her new location. The mall will negotiate short-term leases of six months to a year and set up leases whose rent is based on the store’s monthly sales, LaGrega said. The mall also reserves the right to terminate a lease if it doesn’t feel the retailer will succeed. LaGrega says Newmarket’s managers are not willing to haphazardly fill empty storefronts with just any business. Unprofitable stores wouldn’t help the mall any more than vacant storefronts would, he said. “The worst thing for a landlord is to have a tenants that aren’t doing business,” he said. I need to go to the library when I have a chance and get this article from the microfilm and see if there are any photos of the malls. Checked it out today, there was no photos. A New Look For Newmarket. Mall officials and tenants at Newmarket North are banking on a $9 million renovation to produce an increase in customer traffic and restore the mall’s position in the Peninsula’s retail market. Several stores have closed recently, including one of the mall’s three anchors. Merchants said customer traffic at Newmarket North has been slow in recent weeks, but they added that January is traditionally an off time for retail. Goodman Segar Hogan purchased Newmarket North in July for $44 million. The company soon after revealed plans for the mall’s remodeling, which included an 11-tenant food court and 13,000 square feet of glass and fabric skylighting. A glass-enclosed elevator, community room and permanent stage will also be added. Work in the area of the food court started last month. The total project is expected to be completed in mid-October. At the time of Newmarket’s sale, some retail industry watchers – Goodman Segar officials included – felt the mall had lost ground in recent years to Peninsula competitors, Coliseum Mall in Hampton and Patrick Henry Mall in Newport News. Industry watchers pointed to those malls’ locations near Interstate 64 as providing a substantial advantage over Newmarket North, located on Mercury Boulevard near Jefferson Avenue. Coliseum Mall’s renovation last October could further erode Newmarket North’s market share, industry officials said, and the opening last fall of Chesapeake Square mall in Chesapeake could cut into Newmarket North’s ability to draw shoppers from south of the James River Bridge. Rob Belue, Newmarket North manager, said he was pleased with the mall’s performance in 1989, adding he was expecting a “good single-digit increase” in sales when 1989’s figures are tabulated. “Taking the local economy, it’s been a good solid year for us,” he said. Several mall tenants have left recently. Miller & Rhoads, as part of its bankruptcy proceedings, has closed. Signet Bank merged its mall office into a branch 1 1/2 miles down Mercury Boulevard. The mall did not renew the lease for Circus World, a toy store that then closed. Mr. Sport, a sporting goods store, and Foxmoor, a clothing store, also are gone; Belue cited company problems for those two closures. Eight temporary merchants, some doing business from stalls in the corridors, also closed after Christmas, as planned, Belue said. The mall is working on replacements but did not have any information to release at this time, he said. Belue said he thinks the mall’s renovation and subsequent tenant remix will compensate for the advantage in location enjoyed by Coliseum and Patrick Henry malls. Mall merchants said they expected the renovation to have great impact on mall traffic and sales. Industry watchers were mixed as to whether the renovation will have much of an impact on Newmarket North’s position on the Peninsula. “That mall has never really set the woods on fire since it started,” said one commercial realty agent, who added that Newmarket’s future depends in large part on who owners find to fill the space vacated by Miller & Rhoads. Goodman Segar’s purchase of Newmarket North should not be viewed as a gamble or a crap shoot, Belue said. Of course we all know what happened, the renovation drove even more customers away, and by the time it was completed in November of 1990, even more stores were closed, and I don’t even know the all the spaces in the food court were ever taken up. It was always dead every time we went over there growing up. Usually just Sbarro was open.